Two words - mixed feelings. Let's start with the good news, shall we? My copy of Mirrors was fabulous, and I mean it. Not that it was new (although it was), but it was printed on beautiful paper, in an eye friendly font, decorated by stylish graphics. It would be a pleasure to read even if it consisted solely of blah blah blah. Well, ok, I might be exaggerating here, but only slightly. Short and sweet - I don't trust Mr Galeano. I don't have enough knowledge to speak with any authority about most of his stories, but there are some topics on which I am an expert and well... Let's just say I can't accuse the author of scientific accuracy, or even journalistic objectivity. The way I see it, he takes a story, an event, a myth and tells it in the way that will show his message in the best light, without bothering too much about facts. His message is praiseworthy, sure, but even the noblest of messages suffers when dressed in propaganda. Moreover, Galeano rumbles against using propaganda in politics - and proceeds to use distortions of the truth for his own means. Ouch. 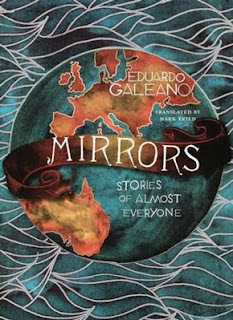 As long as Mirrors is treated as creative writing, as an individual's view on the world's past and present, it is delicious. Just double check the facts before you let it change your world.